ARRIS will sell approximately 10.6 million shares of its common stock, valued at $150.0 million, to Comcast in order to raise money for its previously announced acquisition of the Motorola Home business, which is currently owned by Google. Under the deal, the ARRIS shares issued to Comcast will reduce, on a share-for-share basis, the number of shares of ARRIS stock to be issued to Google and simultaneously increase the cash consideration to be received by Google by $150.0 million. The total purchase price remains the same. Following the close of the deal, Comcast and Google will each own approximately 7.85% of the outstanding ARRIS shares post-closing based on ARRIS' current capitalization. 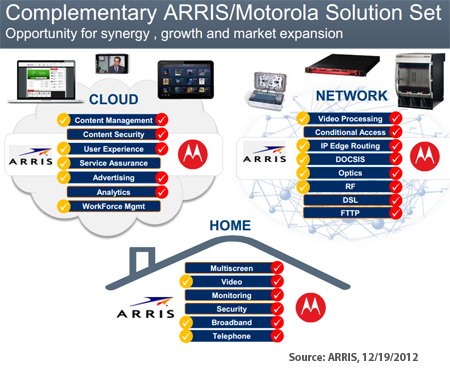 In December, Google agreed to sell its Motorola Home Business to ARRIS for $2.35 billion in cash and stock. Motorola Home is a leading global supplier of digital video and IPTV hardware and software solutions for the cable, telecom, broadcast & satellite markets. The Motorola Home division, which is based in Horsham, PA, had revenues of approximately $3.4 billion over the past 4 quarters and about 5,000 employees. The company is profitable. 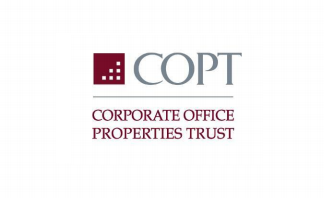 Corporate Office Properties Trust (COPT) has signed a lease with Fortune 500 company for two shell buildings in Ashburn, Virginia. COPT said construction on the first 200,000 square foot building (COPT DC-8) will commence early in 2013 and that construction on a second 115,000 square foot building (COPT DC-9) no later than mid-2014. The company also noted that these two projects brought the company’s development leasing volume in 2012 to 1.2 million square feet. "We are pleased to be able to meet this customer’s need in Northern Virginia, one of COPT’s strategic markets," stated Roger A. Waesche, Jr., President & Chief Executive Officer of COPT. In October 2012, RagingWire Data Centers, which operates 650,000 square feet (60,000m2) of wholesale and retail data center space in Northern California and Northern Virginia, has paid $20 million offer to acquire 75 acres of land in Ashburn, Virginia. 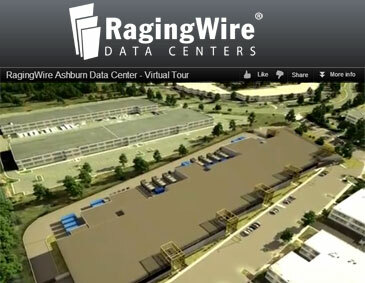 RagingWire said it plans to build a 750,000 square foot (69,000m2) data center in phases on the site. RagingWire currently operates a 150,000 square foot facility in Ashburn, along with its flagship 500,000 data center in Sacramento, California. The current Ashburn facility was activated in July 2012. It features 2N+2 redundancy in its critical facilities infrastructure all the way to the customer’s rack and 21 megawatts of highly available facility power. The campus includes RagingWire’s patented power management system and a number of energy efficiency innovations. 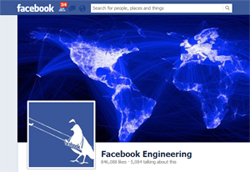 Facebook has developed a three stage back-up strategy for maintain high-availability of its massive MySQL installation across thousand of servers in multiple geographic regions. In this blog posting, Facebook's Eric Barrett describes the Binary logs and mysqldump (Stage 1), Hadoop DFS (Stage 2), and Long-term Storage (Stage 3) components that make up its strategy. On the networking side, he notes that back-up system currently needs to move many petabytes per week. Arrow Electronics will offer converged infrastructure for cloud data centers by integratin the IBM Flex System and the Juniper Networks' QFabric. Arrow said its bundled solution helps customers manage virtualization demands driven by big data initiatives that require integrated server and storage. Tested and integrated into a single part number, the Arrow bundled solution combines the IBM Flex System server, storage, management, and the Juniper Networks QFabric networking speed and scalability. 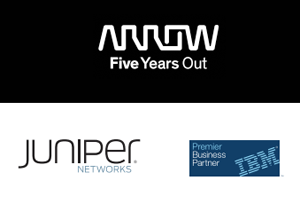 "Arrow is pleased to enable these two technology powerhouses, IBM and Juniper, to come together in a complementary fashion to deliver a robust converged infrastructure solution to the respective channel ecosystems," said Sean Kerins, president, North America, Enterprise Computing Solutions, Arrow. "Customers have clearly demonstrated their preference for choice. This bundle enables solution providers to deliver infrastructure that caters to their customers' current and future needs." The Ontario Superior Court has acquitted Nortel's CEO, Frank Dunn, its former CFO, Douglas Beatty, and its former controller, Michael Gollogly of fraud charges in a case dating back to 2002 and 2003. Nortel posted significant losses in 2001 and 2002 and downsized its work force by nearly two-thirds. Later 2002 and 2003, Nortel published financial results that made it appear as though the company was recovering faster than in actuality. The three former executives were charged with manipulating the company's financial statements so as to appear more profitable and garner bonus payments for themselves. The defendants argued that their accounting methods were approved by the company's outside auditor, Deloitte & Touche. In June 2008, the Royal Canadian Mounted Police (RCMP) formally filed criminal charges against Frank Dunn, the former CEO of Nortel; Douglas Beatty, the former CFO of Nortel; and Michael Gollogly, the former Corporate Controller of Nortel. The charge alleged the three men made false entries and omitted materials particular in the books and documents in regards to the financial results of Nortel. In January 2005, Nortel released key findings of an extensive, independent review, which found that its former corporate management (terminated for cause) and former finance management (also terminated for cause) in the company's finance organization endorsed, and employees carried out, accounting practices relating to the recording and release of provisions that "were not in compliance with U.S. generally accepted accounting principles ("U.S. GAAP") in at least four quarters, including the third and fourth quarters of 2002 and the first and second quarters of 2003." In three of those four quarters - when Nortel was at, or close to, break even - these practices were undertaken to meet internally imposed pro-forma earnings before taxes ("EBT") targets. Nortel posted significant losses in 2001 and 2002 and downsized its work force by nearly two-thirds. The doctored results from 2002/3 made it look as though the company was recovering faster than in actuality. On 27-April-2004, Nortel fired Frank Dunn "for cause." Nortel Networks also fired its former chief financial officer, Douglas Beatty, and former controller, Michael Gollogly, both of whom had been placed on paid leave of absence by Nortel Networks on 15-March-2004. 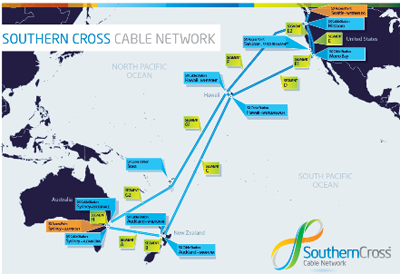 The Southern Cross Trans-Pacific submarine cable network, which connects Australia, New Zealand, Fiji, Hawaii and the west coast of the U.S., is cutting prices by 20% thanks to its 40G & 100G upgrade programme, which is due for completion in February. Southern Cross said its latest price decline marks the second stage of the eighth major capacity expansion programme since 2001. The current stage is based on Ciena’s 40Gbps transmission equipment and takes total lit capacity on the Southern Cross Network to 2 Tbps. The third stage of the current expansion programme is being implemented concurrently and is based on Ciena's 100 Gbps transmission equipment. 100G technology is already installed on some network segments and will take lit capacity to 2.6 Tbps by June 2013. “We have reduced our capacity prices by another 20%”, said Sales and Marketing Director Ross Pfeffer. “This will be our 10th major price reduction since 2000 and over the period our price decline has averaged more than 22% per year... Our protected circuits continue to provide 100% availability and the performance of the six fibre pairs and 500 repeaters on the diverse cable network is better today than when constructed more than 10 years ago." The Southern Cross upgrades use Ciena's 6500 platforms equipped with 40G and 100G submarine-grade coherent line interfaces on each of Southern Cross’ seven segments. Southern Cross is also using Ciena’s 5430 and 5410 Reconfigurable Switching Systems, which offer 3.6 Tbs) and 1.2 Tbps of OTN-based intelligent control plane-enabled switching capacity for bandwidth aggregation and management. The NATO Communications and Information (NCI) Agency has selected Level 3 Communications to install and maintain an IP Virtual Private Network (VPN) to be used by the NATO-Russia Council Cooperative Airspace Initiative (NRC CAI). The joint NRC will have a 24/7 capability to monitor air traffic, thereby enhancing airspace transparency between NATO and Russia. Level 3 said its network will connect a range of NATO monitoring facilities and enable real-time display and observation of commercial airspace activities. Aviat Networks boosted its financial outlook for its second quarter of fiscal 2013, ended 28-Dec-2012, saying it now expects revenue in the range of $123M - $126M. The prior guidance range was $115M - $120M. Orders were greater than revenues. Ixia increased its Q4 2012 revenue guidance to be in the range of $123.5 million to $124.5 million, above its previously stated guidance range of $118 million to $122 million. Combined Q4 revenue from its two recent acquisitions, Anue Systems and BreakingPoint Systems is expected to be in the range of $30 to $31 million, compared with its previously stated guidance of $26 to $28 million. "Ixia delivered an impressive fourth quarter with strong momentum across all of our solutions," commented Vic Alston, Ixia's president and chief executive officer. “The integration of our Anue and BreakingPoint acquisitions is tracking well and we are increasing our presence at enterprise and service provider accounts. Ixia is well positioned to help these customers accelerate and secure the delivery of applications over their mobile and data center networks." Softbank has conducted a technical trial of Sequans’ AIR (advanced interference rejection) technology to determine its value in mitigating interference in LTE networks. Sequans AIR is an interference mitigation algorithm whereby the receiver uses multiple antennas to form a receive beam toward the desired signal and spatial nulls toward interfering signals. Sequans said the laboratory trial used commercial eNodeBs (base stations) commonly deployed in Softbank’s network and a receiver equipped with Sequans AIR. This was tested against a default receiver in both high mobility (vehicular) and low mobility (pedestrian) scenarios. In both cases the Sequans AIR receiver delivered performance gains well above the default receiver, measured at 7dB in the low mobility case and 9dB in the high mobility case. Sequans notes that its AIR technology is designed to work in any LTE network, regardless of eNodeB vendor, carrier frequency, channel bandwidth, or duplexing method. Volex has acquired active optical technology from AppliedMicro for approximately US$2 million. Under the deal, AppliedMicro has agreed to a five-year non-compete in connection with the marketing and sale of active optical cables, transceivers, modules and related assemblies. The companies also agreed to share ownership of the associated active optical patent portfolio, allowing each company to continue development of the technologies, and forming the basis for the two companies to collaborate on next-generation optical interconnect products and solutions. 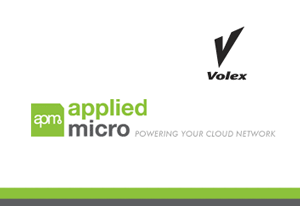 "We chose Volex to take the platform forward due to its strong focus on the active optical cable space and extensive customer relationships in data-center markets," said George Jones, vice president of marketing and business development for connectivity solutions at AppliedMicro. Volex said the acquisition supports its entry into the emerging multi-billion dollar optical interconnect market for high-speed data applications in data center and telecommunications, as well as the consumer, healthcare and industrial markets. Ray Walsh, Volex CEO, stated: "Our data-center and telecommunications customers have been asking for a cost-effective, high-speed optical solution to replace legacy copper interconnects." A new European Cybercrime Centre (EC3) has opened in the Hague, Netherlands. EC3 will focus on illegal online activities carried out by organised crime groups, especially attacks targeting e-banking and other online financial activities, online child sexual exploitation and those crimes that affect the critical infrastructure and information systems in the EU.